The worst may be over for the bond bear market. 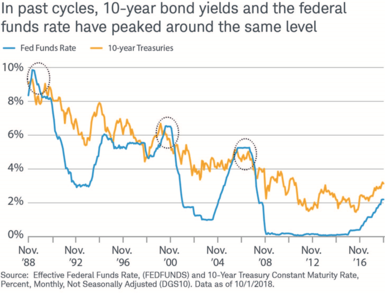 After more than two years of steadily rising bond yields (and falling bond prices, which move inversely to yields), our research suggests that 10-year Treasury bond yields may have peaked for this tightening cycle at the 3.25% level. The Federal Reserve likely will continue to raise short-term interest rates to about 3% in 2019, but we don't see longer-term yields moving much above the recent highs. Tighter global monetary policy, a strong U.S. dollar and sluggish global growth exacerbated by trade conflicts are likely to weigh on economic growth and inflation, limiting the rise in bond yields. However, the path forward isn't likely to be smooth. As markets adjust to tightening financial conditions, volatility is likely to increase. 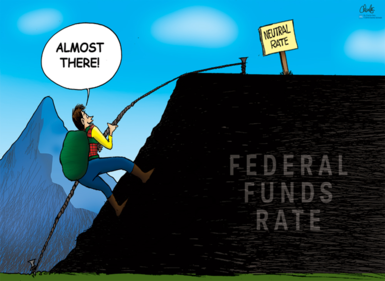 We expect the Federal Reserve to raise rates two to three more times, bringing the federal funds target rate to the 2.75% to 3% area in early 2019, short of the Federal Open Market Committee's 3.4% median estimate for 2020.¹ Because short- and long-term interest rates tend to converge at cycle peaks, the yield curve likely will flatten toward zero. We suggest investors gradually add to average portfolio duration when yields rise. As the Fed normalizes rates and reduces its balance sheet, volatility may increase in riskier parts of the fixed income market - such as bank loans, high-yield and emerging-market bonds - due to issuers' high leverage. We suggest investors move up in credit quality and/or limit exposure to these asset classes. Municipal bonds may post solid performance in 2019, as demand appears strong for tax-exempt income. Consider moving up in corporate credit quality. Corporate bond market risks are rising, but the additional "yield premium" that both investment-grade and high-yield corporate bonds offer versus Treasuries remains relatively low. Consider higher-rated municipal bonds, in the five- to eight-year part of the yield curve. Although muni credit quality is generally strong (albeit with pockets of risk), tight credit spreads don't justify taking on additional credit risk.